Tennessee farmers are cashing in on the local food movement. The federal government never measured just how much Tennessee farmers sold directly to customers at, say, a farmers market, but when it did (for the first time this year), it found a huge, farm-fresh, steaming pile of cash. Tennessee consumers spent more than $58.7 million with farmers directly in 2015, according to the first survey on direct-to-consumer sales from the federal government. 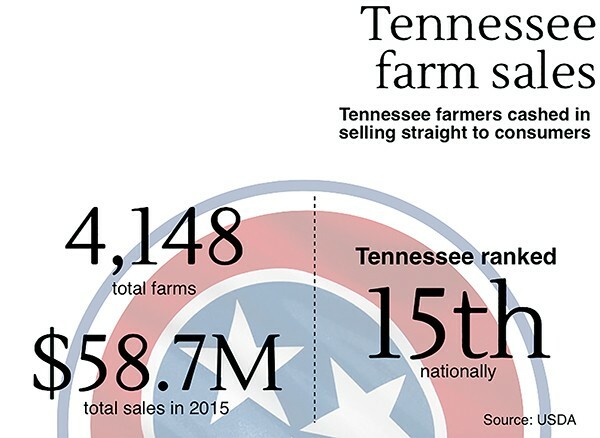 Across the country, Tennessee ranks 15th for the number of farms selling directly to consumers. "We know that many people care about what they eat and want to know where their food comes from," said Tennessee Agriculture Commissioner Jai Templeton. "This survey shows what that farmer-to-consumer relationship is worth in Tennessee." The U.S. Department of Agriculture conducted the survey to get data on the growing and changing local-food sectors across the country. It found that 4,148 Tennessee farms sold food directly to consumers in 2015, and more are getting in the game in a hurry. "The number of farms selling directly to consumers increased more than 500 in the three years since the [last agriculture census]," said Debra Kenerson, a Tennessee state statistician. "This shows tremendous growth in a short period of time." The farm sales include fresh foods like meat and vegetables but also edible processed foods like bottled milk, cheese, meat, jam, cider, and wine. Farmers sold these goods to institutions like schools, universities, hospitals, wholesalers, and distributors. But farmers also sold their goods directly to the person who would eat them at farmers markets, farm stores, roadside stands, through community supported agriculture (CSA) arrangements, online sales, pick-your-own operations, and mobile markets. Sandy Watson, a board member with the Cooper-Young Community Farmers Market, said the more consumers are educated on the importance of eating locally sourced, healthy food, the more likely they are to hit farmers markets for their weekly grocery shopping. This, Watson said, is fueling the local food movement. That movement is responsible for the year-over-year growth seen at the Cooper-Young market and responsible for the big numbers the government found when looking at direct-to-consumer farm sales. Those big sales figures, too, provide a "real opportunity for more farmers to capitalize on the 'buy local' movement," Kenerson said. The strength of that "buy local movement" is a big reason the Cooper-Young market is now open year-round. "We don't stop eating when winter comes, and many of the local farmers are producing year-round," Watson said. "Our winter market is just as busy as the spring/summer market, and some of the best vegetables are those grown in the winter." While much of the food consumed in Memphis was not likely grown here, a move is underway to change that. Last year, the East Arkansas Planning and Development District and the Memphis-Shelby County Office of Sustainability launched Delta Roots: The Mid-South Regional Food System Plan. The plan lays out a 20-year path to a local, sustainable food network here in which consumers will eat more locally grown products and farmers can cash in on the $550 million annual demand for produce in the Memphis area.